1. As always, I start with my awesome GIVEAWAY for the week. Will you be in or able to get to the LA area on November 15? Well why not? There is a shiny new PR waiting for you on this DOWNHILL beautiful course! I am giving away an entry to the Half or Full to Revel Canyon City! Enter to win here. Ends 9/27. 2. Lindsay at Fit and Awesome is giving away a Polar Heart Rate monitor. Enter to win here. Ends 9/30. 3. Debi at 14-in-2014 is giving away 13.1 Girls Run Fast earrings and a runner charm! Enter to win here. Ends 9/28. 4. Diatta at Femme Fitale Fit Club is giving away Energems. They may look like candy but they give you energy! Enter to win here. Ends 9/29. 5. Nicole at My Fit Family is giving away an entire Reva wear outfit of your choice. Enter to win here. Ends 9/26. 6. Carlee at Be the Change is giving away a 4-pack of KT tape. Enter to win here. Ends 9/25. 7. Brienne at Lean Clean and Brie is giving away 2 Tiesta tea pouches and filters. Enter to win here. Ends 10/1. 8. Sam, a brand new #sweatpink Ambassador, blogging at Sly Sam Getting Fit is giving away an Ultrasonic Diffuser to make your house smell delish! 9. Sami at Go Go Mountain Girl is giving away a Hot Chocolate Race 5 or 15K entry! Enter to win here. Ends 9/24. 10. Erica at Erica Finds has 4 GIVEAWAYS for you this week. First up, she is giving away a Words to Sweat By Scarf and Bracelet and Ortholite Cushioned Insoles (3 winners). 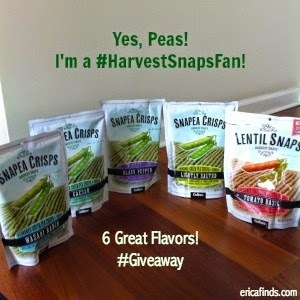 She is also giving away a 6-pack of Harvest Snaps! Also, an Apera Spirit pack bag! Enter to win that one here. Ends 9/30. And finally, a Bestowed Box giveaway! 11. Heather at What the Heck...Why Not? is giving away 2 sample tins of EnergyBits. 12. Ashley at A Lady goes West is giving away a week's worth of Shakeology! 13. Jen at Girl, In Transition is having an Energy Gels Galore Giveaway on her blog! 14. Amanda at Adventures of FitNyx is hosting her very first GIVEAWAY so let's get her LOTS of entries! She is giving away a 10-pack of MeStrength hydration mix with a possibility of more! 15. My friend Ericka at Chronicles of a SAHM is giving away a 4 pack of tickets to the San Diego Kids expo & Fair. Enter to win here. Ends 10/6. 16. Patty at No Guilt Life is giving away an entry to Esprit de She AZ and SHWAG! Who doesn't LOVE shwag?! 17. Julianne at Healthy Lifestyle Choices with Julianne is giving away the September Love for Food box on her FB page. Enter to win here. Ends 10/3. 18. And finally, Susie from SuzLyfe is giving away her version of a Runner Box on her blog filled with things you will love! And there you have it. 18 bloggers. 21 giveaways. 1 post. Don't forget to come back here and tell me if you win! I have to check out those energems! They look like M&M's! !